Somerton Beekeepers, and me, with our Skeps, so far. What an absolutely heavenly way to spend a sunny Saturday in October. Having been a shop keeper, mum & then poorly, doing anything ‘just for me’ on a Saturday still feels like a real treat. Hubby was busy prepping for his cider making season, the boys are all busy with their own social lives, I was therefore free to endulge in a day learning how to make a Skep with Somerset Beekeeper Diana Robertson. I’d first seen Diana demonstrating at the Bath & West Show four years ago. I was in a wheelchair then & id been ‘left’ by her to watch and ask questions whilst Mr C explored the cider tent. I took notes, photographs, and looked forward to being able, one day, to join her annual one day course. Diana even gave me a starter ‘knot’ which has been hanging on a painting in my bedroom ever since! At this year’s Bath & West I was so pleased to see her again, this time I was walking & so enthusiastic that went and found the thatcher she buys her sheaf of straw from & bought a huge bundle with the aim of having a go myself. 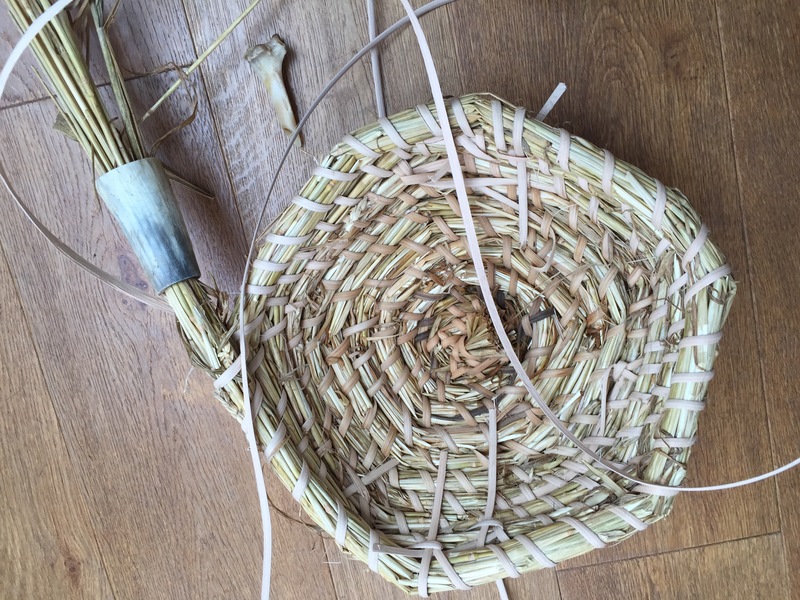 I’d saved turkey bones from Christmas two years ago & ordered some rattan cane from Somerset willow and planned long summer evenings making my skep to bring along to the course today. Of course I didn’t get around to trying all summer but did dig out my turkey bones & unhitched the knot ready to take along to Diana’s secluded garden. I arrived to find twelve other beekeepers drinking tea & coffee in the beautiful garden of her Victorian cottage. Down a ‘no through ‘ road and surrounded by orchards & meadows a gazebo had been put up for us to shelter under. A large trough had straw soaking & we were each given a starter knot. We soon learned that waterproof trousers or a large waxed apron would’ve been the ideal clothing as working with wet straw on your lap does make for soggy thighs! Stewart was on hand with work benches & saws to prepare our bones and give us each a slice of cow horn. These are the tools of the trade. 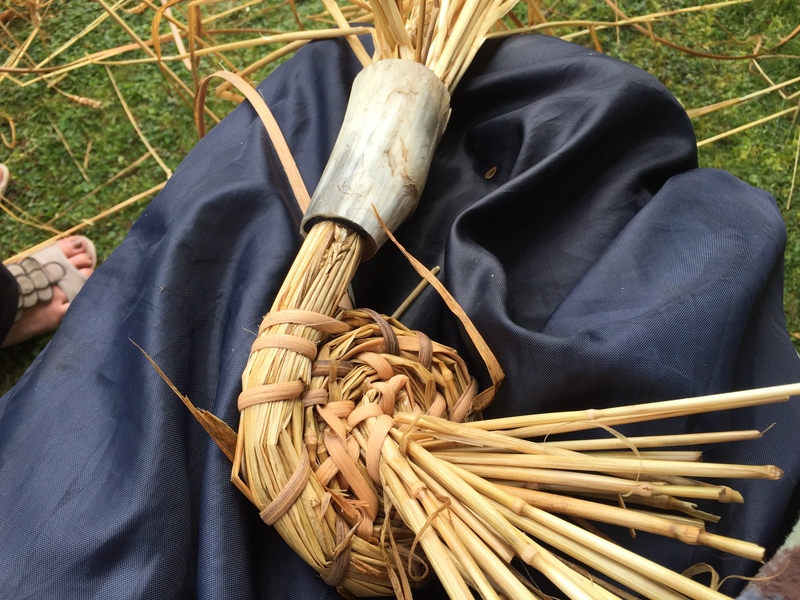 The turkey bone is fashioned into a needle & the horn holds a small bunch of straw in place as the Skep is made. A couple of ladies had excellent needles made from copper piping by one of their husbands. Diana is a very patient & encouraging teacher. One by one she showed us how to make our first stitch, pushing the needle through the straw & threading the cane through the gap made. The cane has a curved & a flat edge so that needed sorting. If your length of cane is too long it twists, if it’s too dry, or too wet, it snaps. 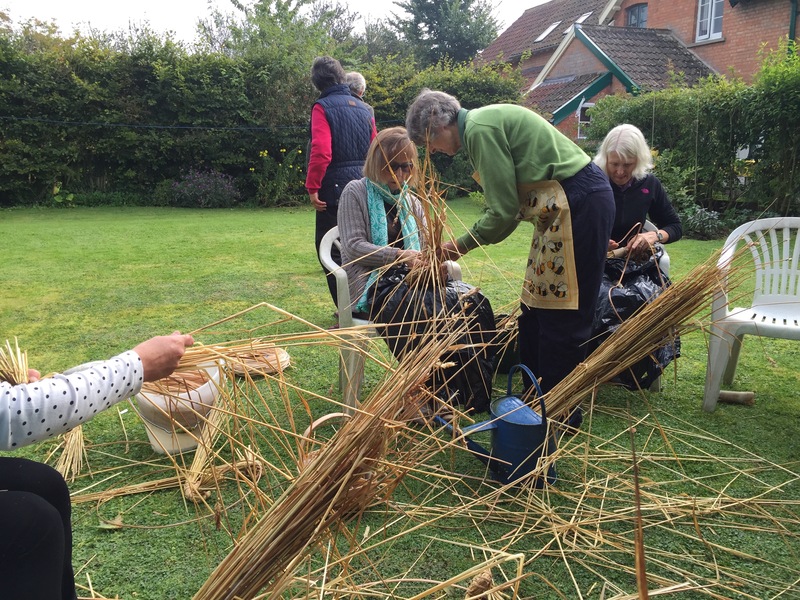 Joining a new piece of cane was the next hurdle for us all, like learning to knit, repetition helps. Gradually as the morning wore on we’d worked out the right distance to sit apart from each other to avoid whipping injuries, and we became confident enough of what we were doing to chat a little. Some people had been before and so brought along what they had started. We soon learned that none of us would’ve leaving with a full sized completed skep today! A young very enthusiastic 14 year old & also a keen & knowledgeable beekeeper, was steaming ahead and went away with a completed mini skep or basket. The rest of us wondered if we’d get beyond coaster or table mat sized pieces! By lunch time we had all started to shape our creations and they gradually all began to resemble the tops of skeps. We were told that in competitions the judging is based on a skep surviving the judge standing on it! We were all doubtful if ours would withstand such a test! We also learned that buckets used to be made of straw, using the same technique we were being taught. Suddenly the old song ‘ there’s a hole in my bucket’ makes sense. As a child I could only ever imagine a tin bucket with its hole packed out with straw! Artist Kate Lynch had interviewed Diana in her book ‘Beekeeping and the Bee‘ so her skill and expertise is now recorded for evermore. Diana ‘s courses aren’t just popular for her passing on of great knowledge, her baking of cakes is famous amongst the Somerton Bee keepers. Not only were there shortbread & flapjacks on arrival, but a delicious vegetable soup at lunch time & a selection of her home baked cakes before we left. All made in quantities that allowed for tasting a bit of each and second helpings! At 4 pm we stopped for the final tea and cake and a group photo before clearing away the evidence of our creative day. I am hoping that I can make time to sit quietly and finish my step, although I did warn Diana that one morning she may look out of her kitchen window to see me sitting there, escaping to the peace and tranquility that her garden offers, this is the kind of ‘productive’ meditation that I REALLY enjoy, and certainly want to continue!